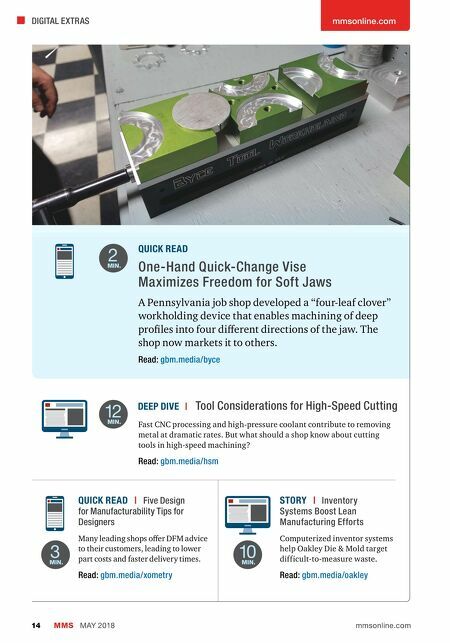 mmsonline.com DIGITAL EXTRAS MMS MAY 2018 14 mmsonline.com QUICK READ One-Hand Quick-Change Vise Maximizes Freedom for Soft Jaws A Pennsylvania job shop developed a "four-leaf clover" workholding device that enables machining of deep profiles into four different directions of the jaw. The shop now markets it to others. Read: gbm.media/byce DEEP DIVE | Tool Considerations for High-Speed Cutting Fast CNC processing and high-pressure coolant contribute to removing metal at dramatic rates. 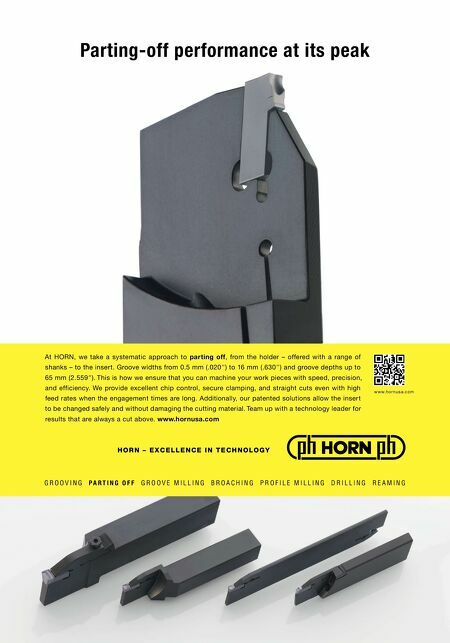 But what should a shop know about cutting tools in high-speed machining? Read: gbm.media/hsm 12 MIN. 2 MIN. QUICK READ | Five Design for Manufacturability Tips for Designers Many leading shops offer DFM advice to their customers, leading to lower part costs and faster delivery times. Read: gbm.media/xometry STORY | Inventory Systems Boost Lean Manufacturing Efforts Computerized inventor systems help Oakley Die & Mold target difficult-to-measure waste. Read: gbm.media/oakley 3 MIN. 10 MIN.